American hams got their first look at the original Yaesu FT-897 at the 2002 Dayton Hamvention. It was the world's first multi-mode, high-power base/mobile transceiver designed to fitted with internal batteries (optional) for portable use. 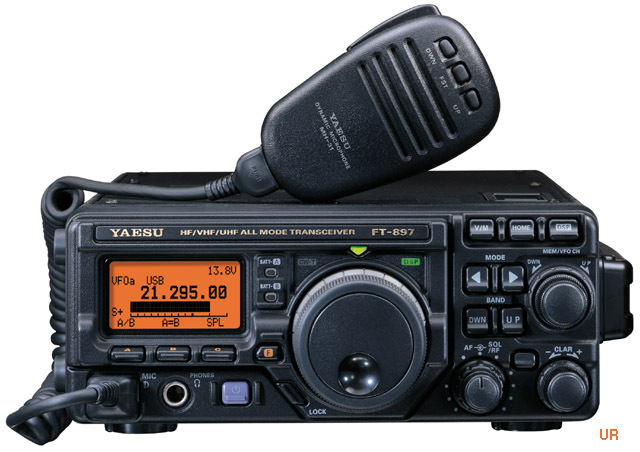 Yaesu now offers the FT-897D deluxe version adding 60 meter coverage and including the formerly optional TCXO9 high stability option. The coverage is HF 160 to 10 meters (including 60 meters) plus 50/144/430 MHz VHF/UHF. Receive coverage is: 0.1-56, 76-108, 118-164 and 420-470 MHz. It is ideal for home, vacation, emergency, rescue, DX-pedition or VHF/UHF rover operation. With optional items the FT-897D system can be configured for mobile, base or portable use. The large multi-color display can be programmed to show different colors on each band, mode, memory group or event to track signal strength by color! 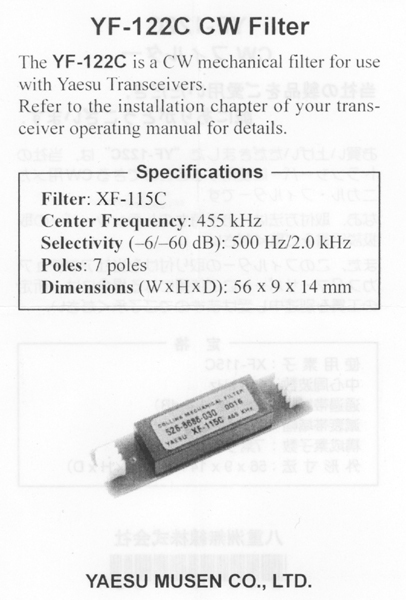 There are two antenna connectors HF/50 and 144/430. 7.9 x 3.2 x 10.3 inches (200x80x263 mm). 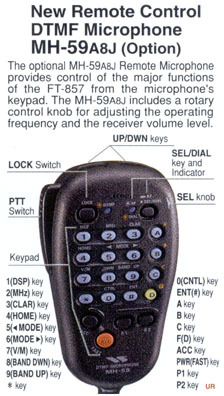 The FT-897 comes with a MH-31A8J hand mic and power cord. * TX Frequency Coverage: 160-10 Meters, 50 MHz, 144 MHz, 430-450 MHz, plus Alaska Emergency Ch. (5167.5 kHz). * RX Frequency Coverage: 100 kHz-56 MHz; 76-154 MHz; 420-470 MHz. 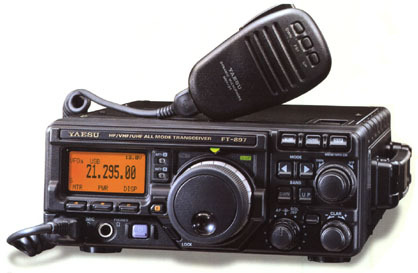 * Operating Modes: USB, LSB, CW, AM, FM, W-FM, Digital (AFSK), Packet (1200/9600 FM). * Digital Modes: RTTY, PSK31-U, PSK31-L and User defined USB/LSB (SSTV, Pactor, etc.). * U.S. Weather Band reception. * Built-in 3-Message Memory Keyer. * Multi-Color LCD Multi-function Display. * Bar-Graph Metering of Power Output, ALC, SWR, Modulation. * Optional Narrow CW and SSB Filters. * RF Gain/Squelch Control/IF Control. * AM and FM broadcast reception. * Dual VFOs, Split Capability, IF Shift and R.I.T. ("Clarifier"). * Dedicated SSB-based Digital Mode for PSK31 on USB/LSB, AFSK RTTY, etc. * Built-in CW Electronic Keyer and Semi-Break-In. * Built-in CTCSS and DCS. * ARTS™ (Auto-Range Transponder System). * Smart Search™ Automatic Memory Loading System. * 200 Regular Memories, plus Home Channels and Band-Limit (PMS) Memories. * Alpha-Numeric Labeling of Memory Channels. 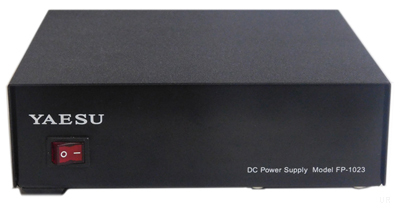 * Automatic Power-Off (APO) and Tx Time-Out Timer (TOT) Features. * CAT System Computer Control Capability Cloning Capability. #4044 ATAS- 25 Portable manually tuned antenna. 7.2 feet. #1615 CD-24 Four hour charge adapter for FNB-78. Copyright 2004-2019 Universal Radio, Inc.